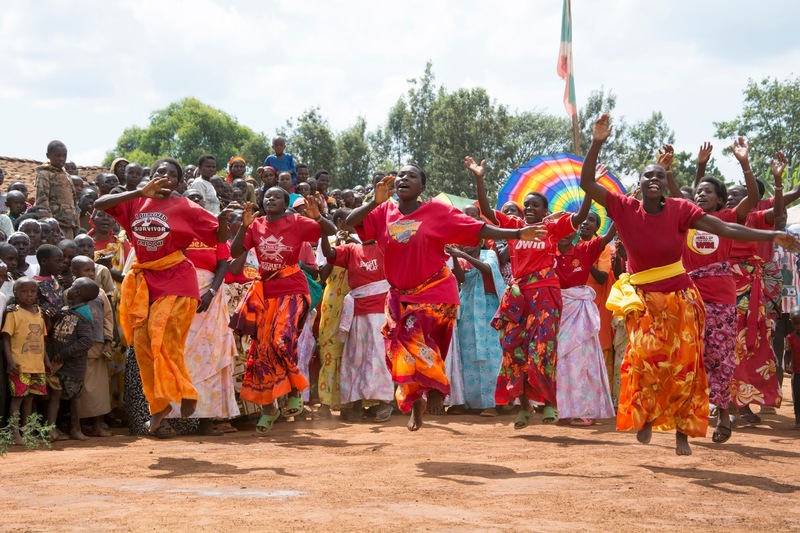 Singing, drumming, dancing, speeches, drama, and feasting lit up January 14th as four communities in Kayanza, Burundi gathered to celebrate their graduation from Food for the Hungry (FH) programing. With joyful spirits and colourful array they marked 10 years of tremendous success. Guests from around the world were drawn to the festivities to represent the thousands of Child Sponsors and supporters from Canada, the UK, and the United States who faithfully cheered on the families of Kayanza as they journeyed from stuck to thriving. The Burundian Governor of Kayanza also attended to personally congratulate the communities on their many achievements. Poverty had robbed the dignity of the people. The brightest highlight of the day by far was the unquenchable joy of children of all ages joining in the activities with laughter and boldness. Their future is now bright with hope. But they didn’t get to this day alone. 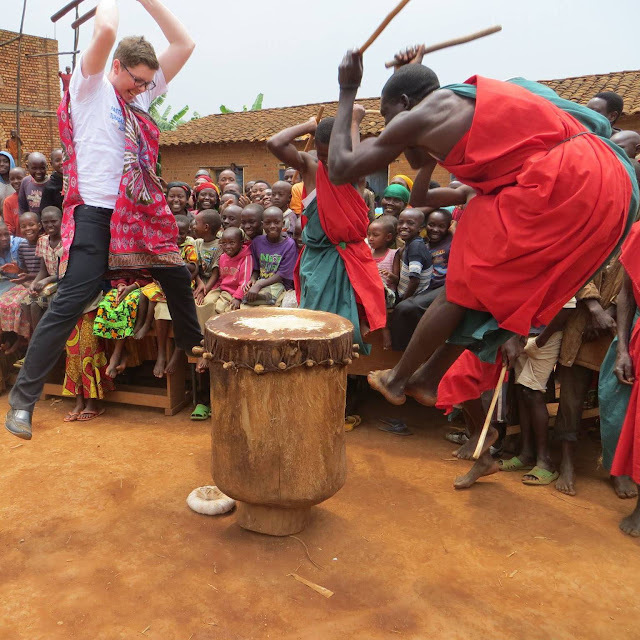 Jeremy Cook gets serious air drumming on a visit to Kayanza. One of Kayanza’s key partners was Sherwood Park Alliance Church (SPAC). Located near Edmonton, Alberta SPAC walked with Kayanza from 2009 until graduation. For eight and half years they poured their heart and soul (and finances!) into seeing these families journey out of poverty. More than 250 church members chose to sponsor children, impacting the lives of 575 children and their families. Over the span of their partnership, SPAC also invested into the relationship by sending over 55 members and volunteers to visit the community. Jeremy Cook, Pastor of Justice & Compassion at SPAC, witnessed the transformation from start to finish and describes his experience of the partnership. Tell me about your involvement with Sherwood Park’s partnership with Kayanza. How did you see this partnership impact your church over the years? J: “Child Sponsorship was a big piece for our church. It was amazing to see how the community as a whole benefits from sponsorship in such practical ways. We also did a lot of teams. We got people there, we got our shoes dirty. We wanted to model to our church that doing development was kingdom work, so we brought experts from here to contribute there. What this did for people in the church was to show them that you can be called to a vocation—any vocation—and God can use that in his kingdom. People realized they had gifts and abilities to give. I imagine you went on a lot of those trips. How did the visits impact you? SPAC has a large congregation; how invested in the relationship would you say your church as a whole was? That understanding and flexibility really does speak to the commitment SPAC showed to Kayanza. How do you feel now that they’ve graduated? Kayanza’s roots in poverty are not unique in Burundi. After 13 years of civil war in the country, Kayanza, like hundreds of other regions in Burundi, was facing tremendous challenges. High levels of malnutrition as well as a high child mortality rate plagued the hillside villages. Poor crop yields, low school attendance, and a lack of leadership made for a dim future. But in 2007, the communities of Mufumya, Musema, Buraniro I, and Buraniro II chose to partner with FH Burundi. FH brought skills training and basic inputs to catalyze Kayanza onto a journey toward health and sustainability. After 10 years of partnership the communities experienced radical transformation in every area of life. The personal journey of Beatrice Mibure, a mother from a farming household, aptly tells the story of the community’s shift out of poverty. Beatrice Mibure and her family. “My husband, kids, and I were living in complete misery. We had a small piece of land and could not produce enough food for my family. When FH came into our community, I was chosen by my neighbours to be a member of a training group. Since then, I have learned sustainable farming techniques. Now I am among people who produce big quantities of beans and maize. I have been a member of a Savings and Loans group for three years and I was able to purchase land for my beans and maize. The income in my family has greatly increased! My family has been transformed forever. Thousands of parents are now supporting themselves and their children. The community as a whole has made incredible strides in the areas of education, health, livelihoods, and leadership. They are truly self-sustaining, able to carry their own development into the future with confidence and strength.